In comedy, sometimes you kill and sometimes you die, but in the box office you can always boost your event sales. 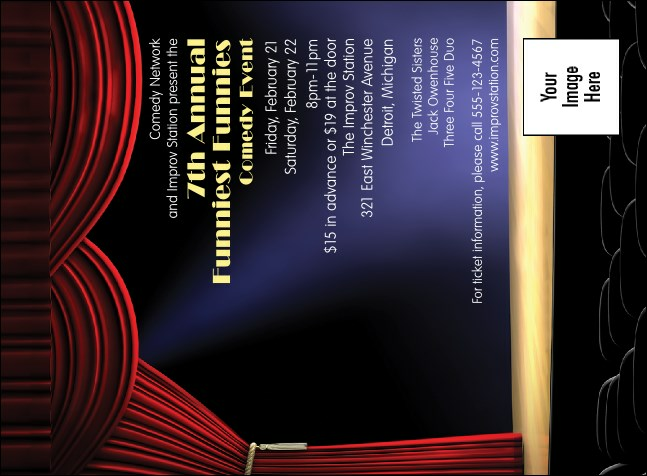 Check out the Stand Up Comedy Invitation, featuring heavy red curtains over an empty wooden stage, recalling that anticipatory moment before the show begins. Bring the crowds to you with the right invitation for any event. At TicketPrinting.com, you'll find the answers to all your printing questions.